"Here are some popular ways for RVer's to go Online"
According to the Michigan Association of Recreation Vehicles and Campgrounds (MARVAC), there are approximately 7.2 million RVs on USA roads today. These stats include motor homes, travel trailers, folding camping trailers, truck campers and van conversions. MARVAC also reports 25% of RVer's access the internet while on the road. As more RV'ers seek out RV Internet Service while traveling, this statistic will continually increase. Although this method is definitely not a speedy way to secure RV internet service, it is an extremely useful way to get your emails while traveling. First, set-up a "web based email account", such as Yahoo or Hotmail, then access the internet with your cell phone and login to your email account from the comfort of your RV while travelling. Also, your cell phone can be used as a "modem" for internet access on your computer (the one you brought with you in your RV). In other words, the cell phone provides the internet accessibility on your computer. The computer is connected to the cell phone using a USB Cable or Bluetooth. Of course, the main benefit of hooking your cell phone up to your computer, is the larger screen you'll be able to use instead of the smaller Cell Phone screen. A couple of things to keep in mind with this option is to carefully review the "minutes" package-deal you have with your cell phone provider. If you're not careful you can really rack up the minutes and your bill. Also, when you're using your cell phone to hook up to the internet, you can't use it as a phone for that time period. Oh, but fear not, you can get "computer telephone access" to solve that problem. Yes, in some cases you would have to leave your computer on at home, with your internet hooked-up to it. Remember that power failures can happen at home while you're away, so if you leave a house key with a neighbor or friend, there may be times they need to reset your home computer so you can regain remote access. This is a service you sign up for, that enables you to remotely connect to the computer(s) of your choice. 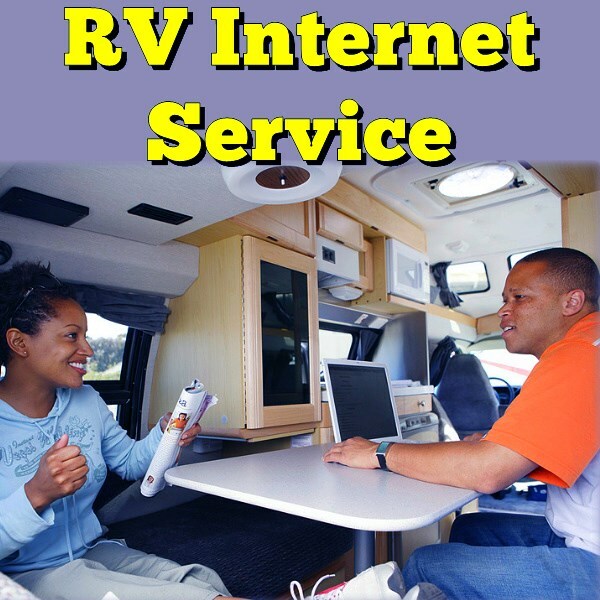 These systems can give an RV'er internet Service virtually anywhere, anytime. If you travel to remote locations where getting access via other wireless applications wouldn't work, this is definitely an option to further examine. These systems are mounted to your RV roof top or can be a separate auxiliary unit. When you are stopped, you then get RV internet access. Note that this is an expensive option. Prices can be in the thousands of dollar range. For example, the roof top system offered by MotoSAT's DataStorm ranges between $5000 and $5500 with a $99 a month unlimited access fee. It's safe to say, this isn't the most practical choice for the average RV'er. A computer with a WiFi Card will, in most cases, get you access to the internet right from your RV. RV parks, and other locations, are installing Wireless Fidelity Networks, which essentially enable you to directly connect to the internet so long as you are in range of this network. The internet provides lists of "hot-spot" maps, giving the traveler an idea of where Wireless Fidelity Networks can be found. Restaurants, coffee shops, RV parks, Trucks Stops, are a few example of locations that may have WiFi, so with your own computer and a WiFi card, you are able to access the internet. Not much to say here. Some RV parks offer the ability to hook up to their modem, usually in a central location or an office of sorts. This isn't very convenient, as you have to leave the comfort of your RV with computer in hand and hook-it up to their modem. A park offering WiFi would have little need for this option, however, just in case, most have them. RV Internet Access should be a painless procedure, and having to walk to get it, isn't what some consider "painless".